Origin of the Adoro Te symbol Thanks to Kristen Gawley for the original artwork. ​Lord Jesus, Good Pelican / Wash me clean with your blood, / One drop of which can free / The entire world of all its sins. All families who have chosen to educate their children at home are eligible to apply to Adoro Te. Families that do not homeschool but are considering this option are welcome to attend Adoro Te events as Guests. If you are would like more information about the group, please use the "Contact Us" link found in the menu at the top of this page. If you are interested in participating, please use the "Contact Us" link above. 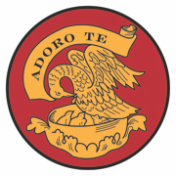 Adoro Te is a number of families who have chosen to homeschool and work together to offer spiritual, social, and educational support to each other. We are loyal to the Magisterium through Pope Francis. Inspired by the example of Mary’s humility, Adoro Te families strive to demonstrate the virtues of charity, hospitality, and modesty in action, word, and dress. Adoro Te has Guidelines which are reviewed annually and must be accepted by Adoro Te families prior to participation in activities. The physical, moral, and mental safety of our children, families, and guests is paramount. Only Adoro Te families can access Administrative and Participation Information at this link all others must submit a Contact Form through the Contact link at the top of this page. We define homeschooling families as families with one or more K-12 aged children who are currently homeschooled, or Adoro Te families who have at least one child who has graduated high school with Adoro Te. A family may also participate in Adoro Te if they are seriously considering homeschooling children the following school year. Adoro Te is not an academic institution. Through the cooperation of families, and coordination of resources, we strive to offer Christ-centered extracurricular activities for our homeschooled children. Recognizing that some families are discerning homeschooling, we welcome their attendance at appropriate Adoro Te activities as Guests. Every Adoro Te parent is welcome to participate on the Steering Committee which meets annually and as needed. Among other things, the Steering Committee reviews proposed and current activities, the Adoro Te Information Packet including Guidelines, the annual Adoro Te budget including the Family Contribution Amount, participation and all other matters related to Adoro Te that may be brought up at the meeting(s). A small group of parent volunteers who provide feedback and advice to the General Coordinator on matters related to the daily administration of Adoro Te as needed or requested. Members of the panel are listed below and meet as needed. A small group of parent volunteers who receive an annual or periodic report(s) from the Treasurer, advise the General Coordinator and Treasurer on financial matters and submit a proposed annual budget to the Steering Committee. The Finance Committee meets annually and as needed. The Finance Committee is headed by the Finance Committee Chair and the members are listed on the Adoro Te website.